Continuing the grand sweep of alternate history begun in The Calculating Stars, The Fated Sky looks forward to 1961, when mankind is well-established on the moon andlooking forward to its next step: journeying to, and eventually colonizing, Mars. Of course the noted Lady Astronaut Elma York would like to go, but there's a lotriding on whoever the International Aerospace Coalition decides to send on thishistoric -- but potentially very dangerous -- mission? Could Elma really leave behindher husband and the chance to start a family to spend several years travelingto Mars? And with the Civil Rights movement taking hold all over Earth, willthe astronaut pool ever be allowed to catch up, and will these brave men andwomen of all races be treated equitably when they get there? This gripping lookat the real conflicts behind a fantastical space race will put a new spin onour visions of what might have been. 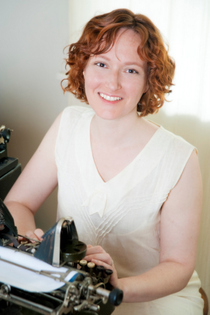 Mary Robinette Kowal is the author of Shades of Milk and Honey (Tor 2010) . In 2008 she won the Campbell Award for Best New Writer, and in 2011, her short story "For Want of a Nail" won the Hugo Award for Short Story. Her work has been a finalist for the Hugo, Nebula, and Locus awards. Stories have appeared in Strange Horizons, Asimov's, and several Year's Best anthologies as well as in her collection Scenting the Dark and Other Stories from Subterranean. Mary, a professional puppeteer and voice actor, has performed for LazyTown (CBS) , the Center for Puppetry Arts, Jim Henson Pictures and founded Other Hand Productions. Her designs have garnered two UNIMA-USA Citations of Excellence, the highest award an American puppeteer can achieve. She also records fiction for authors such as Kage Baker, Cory Doctorow and John Scalzi. She is the Vice President of Science Fiction and Fantasy Writers of America. Mary lives in Portland, OR with her husband Rob and over a dozen manual typewriters. Visit www.maryrobinettekowal.com.